WATCH pastor's retort after Houston Proposition 1 big spending promoter says "YOUR CHURCHES WILL FAIL"! "You can't do indirectly what the law says you can't do directly" by calling this new TAX a FEE! 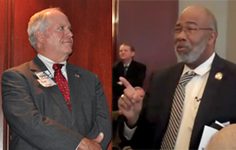 That's what one moral and law-abiding pastor respectfully retorts (VIDEO) after "Renew Houston" and Proposition 1 special interest promoter Bob Jones proclaimed, "... your churches will fail" if Proposition 1 is not passed. The attendees didn't buy it and instead blew the whistle on more special interest spending at the recent Houston Pastors luncheon addressing Proposition 1. Mr. Jones, co-founder of civil engineer law firm Jones & Carter, tried to persuade pastors their "churches would fail" if massive new fee-and-spend scheme "Proposition 1" doesn't pass on Tuesday, Nov. 2 at the polls. Bob Jones substituted for City Councilman Stephen Costello, a civil engineer and promoter of the proposed fee, spending and government expansion of Renew Houston. According to the Houston Chronicle, "Costello acknowledged that his company, Costello Inc., has received about $3.5 million in Houston contracts over the past 18 years." But several other notable and alert city council members have already noted the vagaries and open-ended fees of Proposition 1 and have stood up on behalf of their constituents. They and others say "let's start over" and have urged voters to VOTE AGAINST Proposition 1. Proposition 1, if passed, would impose an unspecified (er, expect it to be BIG) monthly "FEE" on churches, charities and schools... and by the way, schools already receive our tax dollars and now they would either need to lay off teachers unless we raise our "taxes, er bonds, er, fees?" that we citizens pay to the schools. And if city council ever were to ever invest its valuable time to "exempt" the many organizations harmed by proposition 1, that would mean everyone else gets to pay MORE! Councilman Costello has explained that money for the spending scheme will come from "a matrix of funds". But analysis of available funding sources (or "matrix of funds") so far has resulted only in the discovery of "seven deadly sins of Proposition 1", according to Elizabeth Perez, a Houston area political economist. 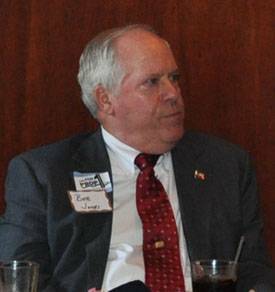 Paul Bettencourt the "tax man" (former Tax Collector and Assessor for Harris County) has publicly opposed the ballot proposition as even worse than a new tax and also featuring a "lock box without a top". 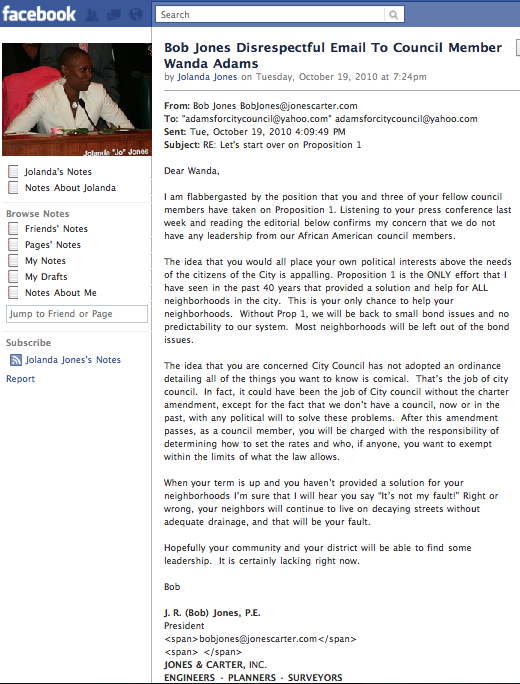 Bettencourt urges voters to VOTE AGAINST PROPOSITION 1. Mr. Jones was arrogant to the pastors and invoked fear tactics in a lousy attempt to persuade the pastors. When pastors asked why churches would be taxed when they should be exempt, along with schools, non-profits and senior citizens, Mr. Jones responded in a condescending manner claiming that it was a fee and not a tax. . . Pastor John D. Morgan of Sagemont Church (pictured above) reminded Mr. Jones of his rebirth as a born-again Christian and urged him to think as a Christian man and not an engineer. Mr. Jones was not moved. The luncheon ended with Mr. Jones being upset with the pastors for not agreeing with him. 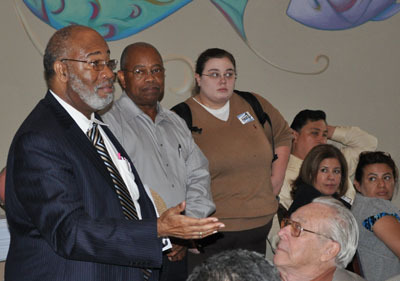 The Pastors decided "AGAINST" proposition 1 and held a news conference shortly after the luncheon. Note to Bob.....City Council Member Mike Sullivan is also against Prop 1, but you didn't write an email criticizing the lack of leadership from the Anglo American council members, did you? No, instead you complain because someone dares to question the $170,000 bet (donation) you placed on Renew Houston for a chance at an $8 Billion jackpot. Bob Jones makes a big government tax and spend argument (or are we supposed to say "fee and spend"?) by trying to scare a roomfull of pastors with the statement, "If you'd like your neighborhoods, your churches to be better, they will be better if we rebuild our streets and drainages. If you don't want to rebuild the streets and drainages, don't rebuild the streets and drainages, your churches will fail." This pastor and several others blew the whistle. While maintaining all dignity and decorum, but with the moral voice of outrage about recklessly expanding big government at the expense of churches, charities, schools and citizens by calling a proposed new tax a "fee", the pastor pictured above graciously explains "with all due respect, [Mr. Jones] you cannot do indirectly what the law does not allow you to do directly."